There is that word again! We have been having a “national conversation” about gun control since before I was born. In fact, the conversation never seems to change. …and move something through Congress. Move what through Congress? It doesn’t really matter. “Something” will do, since for liberals, legislation consists largely of symbolism and magical thinking. I will put forward a very specific proposal based on the recommendations that Joe Biden’s task force is putting together as we speak. Obama reiterated his support for a ban on military-style assault weapons and high-capacity ammunition magazines that gun control advocates in Congress have said they will be pushing for. Because the ban on “military-style assault weapons,” also known as modern sporting rifles, worked so well last time! And the attack on magazines that hold more than ten bullets (most do, if you are talking about full-sized handguns, let alone modern sporting rifles) is perhaps the dumbest measure of all. It is analogous to Mayor Bloomberg’s ban of large soft drinks. Bloomberg doesn’t seem to understand that if people want more soda, they will just buy two. Likewise with magazines. 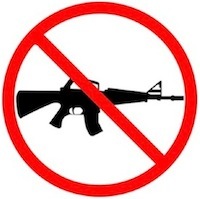 California already bans high-capacity magazines (just as Connecticut already bans “assault rifles”), but that hasn’t turned California into anything resembling the Garden of Eden. But these observations are probably beside the point. For many liberals, legislation isn’t about achieving any tangible result, but rather is intended to make a statement about yourself: I care! Obama is smart enough to know better, but cynical enough to play to this element of his base.